ACID Blue Deep Dish 5-Pack Free With Box Purchase! 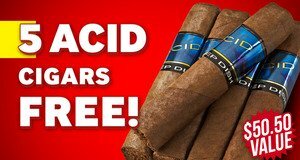 Buy a box of ACID cigars, get 5 ACID Blue Deep Dish cigars, valued at $50.50, absolutely FREE! 5 ACID Blue Deep Dish cigars free with purchase!